The long awaited 6th studio album 'Mundy' out now!!! Click here for Dates,Venues and Ticket Links! The Galway Girl [from Mundy’s live album Live & Confusion] is the one thing I’m sure to be remembered for. I owe a lot of that to Mundy… the biggest hit was his version. People probably won’t even remember who the hell I was, but they’re going to be singing that song in Ireland for a long time. I really do believe that. And that’s the only kind of immortality anybody can hope for. 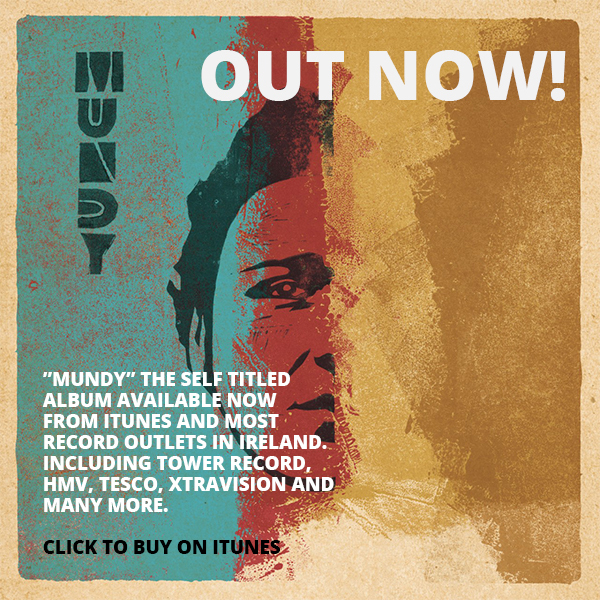 ”Mundy” the self titled album available now from iTunes and most record outlets in Ireland. Including Tower Record, HMV, Tesco, XtraVision and many more. Mundy Solo at Harolds Cross Family Day,Dublin. Mundy will play for an Hour at this all ages family day.This is a day time event.Time TBC. Admired by the likes of Shane Mcgowan, Damien Dempsey, Richard Hawley to name a few, this incredible artist has a brand new album coming out which we are all very excited about. Don't miss the chance to hear some fantastic new material as well as the legendary stuff from his back catalogue..
Mundy and Band at Bandon Music Festival,Co.Cork. Mundy and his full band will play at the Bandon Music Festival.This is an outdoor event.Times TBC. Mundy at the Purty Kitchen,Dun Laoghaire, Co.Dublin. Mundy and one other accompanying musician will play an Intimate set at this great venue near Dun Laoghaire. Well you already know I really love this one M! So good! Beautiful real words about dear Joe ❤️ Waking into Whelans tonight without a hug from Joe just wasn’t the same. He will never be forgotten. A beautiful tribute to what sounds like one great man. RIP Joe. That's gorgeous and so appropriate Man. who I knew from Whelans, Wexford St, Dublin. No disrespect to his family but he minded us as we were coming up through the ranks over the years in a fatherly fashion. Fair play Mundy, beautiful tribute ! Nice one Mundy; rest well Joe. The music industry kills independent artists. I took a photo on the way to my gig @rockwoodmusichall in #newyork last October. It was an anxious journey getting there due to rush hour traffic. My heart was in my mouth with nerves, adrenaline and a broken leg. Very evocative Mundy, you gots skills!!! I was there? You had support from Nick Carswell and Jason Slote of Carswell & Hope band. Great gig and in New York!! Lovely painting Mundy, it epitomises New York so well 💖. Love it. Similar to Dylan and Ron Woods style. Ask David Traynor - it was a good gig.